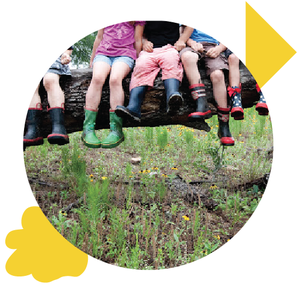 To celebrate the winter solstice, Marie Catrett has generously shared with Alt Ed Austin’s readers the gift of this moving story, adapted from a letter she sent yesterday to the parents of her students at Tigerlily Preschool. (It turns out to be a story within a story within a letter within a blog post!) Enjoy—and may your long winter nights be filled with light. I’m still moving through all the layers of the story I’m sharing here today. It touches many different parts of me and my work here. You might already know that Reggio thinking, which I admire so much, began with a school started in Italy built literally from the rubble of World War II. Such a respectful, empowered view of learning arose from terrible circumstances. Of the many stories I'm learning in my own teaching journey, you could say Reggio thinking hooked me from the start as I'm a sucker for a good phoenix tale. . . .
Word had it that at Villa Cella, the people had gotten together to put up a school for the young children; they had pulled out the bricks from the bombed-out houses and had used them to build the walls of the school. Only a few days has passed since the Liberation and everything was still violently topsy-turvy . . . I felt hesitant, frightened. My logical capabilities, those of a young elementary school teacher overwhelmed by the events, led me to conclude that, if it were true (and how I hoped it were! ), more than anomalous or improbable, it was out of this world . . . maybe someone from Cella would show up. No one did. That is why I got on my bicycle and rode out to Villa Cella. I got confirmation from a farmer just outside the village; he pointed out the place, a long way ahead. There were two piles of sand and bricks, a wheelbarrow full of hammers, shovels and hoes. Behind a curtain made of rugs to shield them from the sun, two women were hammering the old mortar off the bricks. The news was true, and the truth was there, for all to see on this sunny spring day, in the uneven but stubborn hammering of these two women. One of them looked up at me and waited; I was a stranger, someone from the city, maybe they could tell from the part in my hair or my low-cut brown shoes. “We’re not crazy! If you really want to see, come on Saturday or Sunday, when we’re all here. Al fom da boun l’asilo (we’re really going to make this school)!” . . . I had the honor of experiencing the rest of the story . . . and it remained an uninterrupted lesson given by men and women whose ideas were still intact, who had understood long before I had that history can be changed, and is changed by taking possession if it, starting with the destiny of the children.
. . . a new educational experience can emerge from the least expected circumstances . . .
Willa: (Upon arriving, handing me a small gift to unwrap; she and I are holding something wrapped in tissue) Look, can you see a little bit of golden peeking out? Willa: It makes me think of a bird. (Gesturing to the folded paper that is with it) Read the words that tell you about it! Willa gives me a hug and skips off to play. 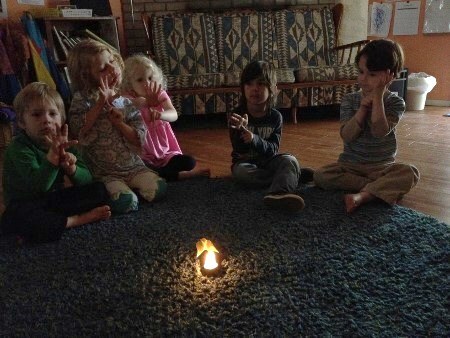 I watch the children, holding the candlestick for a while, until I call the children in for circle. Marie: I want to tell a story that takes place in a far-away place called Cambodia. The people there were a having a big terrible problem where some people thought one thing and some people thought something else. And the people didn’t do talking about it. They got mad, mad, mad, mad and had a war. Willa: It’s when you get so angry you’re like (waving arms like sword play) and set off bombs. Marie: Big big fighting, mmmhmm. Emerson: Yeah, and sometimes wars have those truck things that shoot out bullets. And bombs, they explode. Willa: [In Cambodia] there were some bombs that didn’t explode, right? Nayan: And there’s some places far away that didn’t have problems. Kids name some far-away places. Marie: This story is about the place called Cambodia. Nayan: And there was bullet world. Marie: The people there were having the terrible problems with each other. But then the people thought it was too much fighting and wanted it to stop. The people that thought one thing and the people that thought a different thing started talking to each other. And about how to fix the problems. Like how kids say, “I’ll be nice to you if you’ll be nice to me.” Finally the people did that. They said, “I’ll be nice to you if you’ll be nice to me,” and it stopped the fighting. But, because of all the fighting they’d had, there were still some bombs where they lived. So some people had the job to go find the bombs and put them away so they couldn’t hurt anybody. Emerson: Spray them with water to try to kill the fire in them! Marie: Yeah, they have ways to make them not dangerous anymore and had workers to do it. And, the people also wanted to make stuff. So when they had made the pieces of the bomb not dangerous anymore people thought and they thought and they thought. And they thought: hmmm, we had these big problems . . . and now things are better . . .
Emerson: (Really excited) And! And I know! How ’bout they make something out of those bombs?! And fill them up with water so it’s safe! Willa: Yeah! And the water can just squirt out if there is a fire, (with a button like) push push push! Marie: They did just exactly that, they did decide to make something good out of the stuff that had been the bombs. Willa: They made a candle holder! They made something beautiful. This is something that my mother got for Marie that’s really really delicate. Daphne: Is it her Christmas present? Willa: It is her Christmas present! I wrapped it. Emerson: It was in a box, right? Willa: Yeah, and I wrapped it with blue paper, and I used a yellow ribbon for her. Marie: We can pass the candle holder around before we light it ’cause I would like to share it with everybody. 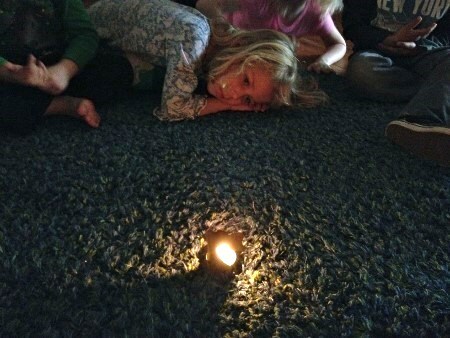 Kids pass the candle holder around the circle, quiet and focused. Marie: Everyone take one little scoouch back so we can light it, all see it, and be safe about the candle flame. (Getting ready to light the candle) Oh, I’m feeling so many feelings! That this candle used to be a bomb for hurting. And then people started talking, and made things better. And then people decided to make something beautiful out of it. Nayan: Should you light it now? Willa: It might do burning? Marie: Well, it can’t do any more hurting now, it’s a candle holder, now that the people have made it into something wonderful. Willa: It might burn up the metal? Daphne: Or it might go all over the house? Marie: Now it can’t be anything but a beautiful candle for looking at. I’m sure it’s completely safe. (Being careful like we are about candles when we light one together, I would add, though in the conversation I am certain the kids are needing to know that the candle can’t be a bomb anymore). This candle has been on a very big journey. It was a bomb, it used to be able to do hurting, but then the hurting stopped and people made it into a new thing, a wonderful thing. And then a mama saw it and thought it would be a good present. To be a beautiful candle to be special at our school. And a kid put it in a pretty striped box and wrapped it up in blue paper and tied it with a yellow string and gave it to me. And I opened it up and learned the candle’s story, and now I’m telling the story of the candle to you children. Emerson: I wish I had it. Marie: We’ll enjoy it, all of us together, and that’s the best part now of this candle story. It’s a pretty wonderful thing. Won’t let anyone (whsssh!) it out, I’m gonna let it shine . . . Hide it under a bushel? No! I’m gonna let it shine . . .
Take this light around the world, I’m gonna let it shine . . .